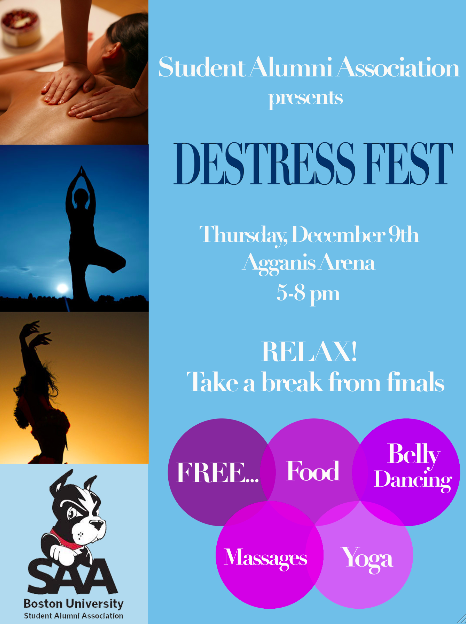 Problem: Promote “De-Stress Fest” event despite Boston University campus-wide hectic final exam week. Solution: Students turn to procrastination tools (social media) in times of quick stress releases. Working alongside the SAA’s communication team, we designed a short promotional video depicting the anxiety of student final preparation. The video was uploaded to Facebook, attached with the De-Stress Fest event link. All 50 SAA group members changed their default photos to the flyer and dedicated their status to the event. I sent a press release and electronic flyer to BU’s student run media publications: BU Today (featured in Dec 8th, 2010 edition) and BU Quad (featured in December 10th, 2010 edition). The BU Quad even quoted me: “People get freaked out when exams come. Yesterday the study room in Stuvi 2 was packed at 4:30 in the morning,” Ellen Cohn, a Junior in the School of Communications and member of the SAA Communications Team, told the Quad on Thursday night. She was giving an attendee a massage–one of the many activities featured. SAA joined with Women’s Basketball and Agganis Arena to cross promote each other’s events. If you picked up your free basketball ticket, you were allowed entry into the event at Agganis Arena. The @BU_SAA Twitter tweeted prior to the event and cross promoted with other BU twitter groups. Return: In total, roughly 100 students attended “De-Stress Fest”. Free merchandise was given away with various on-campus or company advertisements and a small rise in sales was seen by the company. Problem: Publicize Angora Café’s frozen yogurt despite the advancing, cold winter weather. Solution: We first strengthened Angora Cafe’s Twitter and Facebook membership/follow/like pages. Then we created a special event to promote sales and drive store traffic. 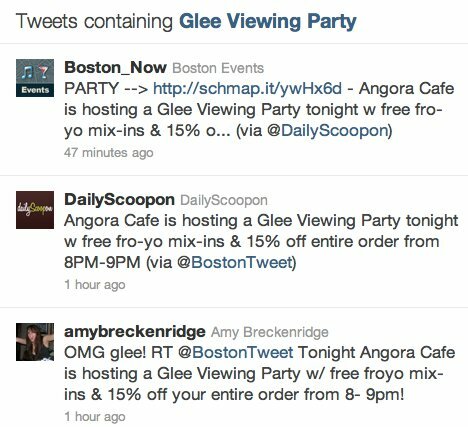 If consumers came to Angora Café between 8-9pm to watch Glee on Tuesday, November 9th and Tuesday, December 14th; they received 15% off their order and free frozen yogurt mix-ins. Our PRSSA team wrote Tweets and Facebook status updates describing the delicious Mediterranean food products and special event “Glee Party”. We interacted with Twitter followers, like @BostonTweet, who mentioned the event. I sent a press release to all of the Residence Life offices of the BU dorms, to send to their Residence Advisors to hold floor events. Return: During 8-9pm on Tuesday, November 9th and Tuesday, December 14th, sales went up roughly 40%. Students were excited to watch Glee and receive the discount, and asked us when we would be holding more events. Solution: In addition to weekly Shabbat services every Friday, we sponsored a series of events. Rosh Hashana/Yom Kippur high holiday services Sept 8th, 2010. Edible Sukkah Making: September 20th, 2010. Free Shabbat Dinner: Friday, October 29, 2010. In addition to the usually Facebook invites, my communications team and I made a consistent effort to reside in the Hillel House. By increasing our presence, whether to eat meals, do homework or a meeting spot for hangouts, we stimulated the idea that Judaism doesn’t have to be a boring, somber experience, but it can be a community and social experience. We individually reached out to eager new students to peak their interests and invite them into our group. A personal touch was needed to connect to students. Return: Still a work in progress. While we did see a small increase of loyal membership, it’s challenging to increase attendance when most Reform Jewish students pray in their own way, whether through nature, in their dorm room, or celebratory events. Students don’t need our Shabbat service to feel connected to Judaism.